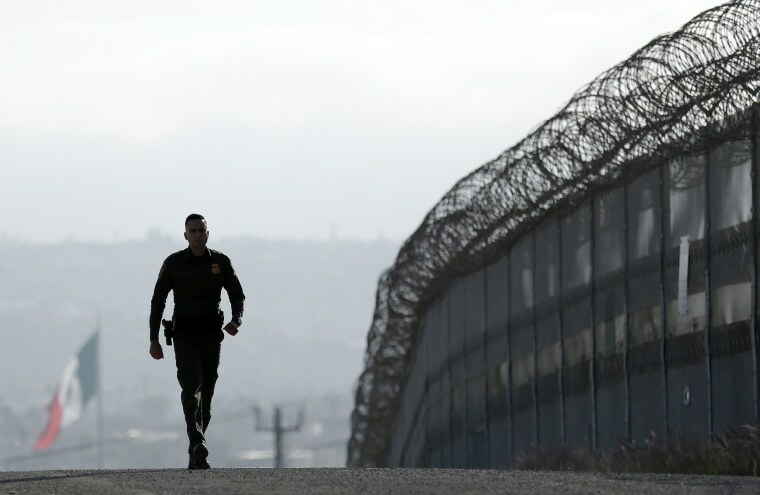 President Donald Trump pledged to build a wall along the Mexican border and its construction is still at least a year away — but border patrol arrests have dropped to a 45-year low, according to figures released on Tuesday. At the same time, detentions for people arrested away from the border jumped 25 percent. Those are made by Immigration and Customs Enforcement, which arrested more than 143,000 during the 2017 fiscal year that ended on Sept. 30, according to the Department of Homeland Security. Customs and Border Protection made more than 310,000 arrests during the 2017 fiscal year, including nearly 304,000 arrests along the Mexican border, the Department of Homeland Security said. The statistic reflects a 25 percent decline from the previous fiscal year and the lowest level since 1971. Illegal migration plunged immediately after Trump was inaugurated, from Jan. 21 to April, marking the lowest period of border enforcement activity on record, according to the Department of Homeland Security. “We have clearly seen the successful results of the President’s commitment to supporting the frontline officers and agents of DHS as they enforce the law and secure our borders,” Acting Secretary Elaine Duke said in a statement. And border arrests have steadily increased each month since May, the department said. The Border Patrol's acting deputy commissioner, Ronald Vitiello, said he is “very concerned” about the most recent uptick in apprehensions of unaccompanied minors and minors with a family member. And “Interior removals” of people who were deported after being arrested away from the border soared 25 percent to 81,603 from 65,332 last year, according to DHS. Those arrests climbed 37 percent in the months since Trump took office when compared to the same period during the previous year. Advocates say the Trump administration's intense focus on immigrants is detrimental to the fabric of the nation and leads to civil rights abuses. "Trump's wall and more agents are dangerous, wasteful proposals that would be catastrophic for border communities," Chris Rickerd, a policy counsel at the American Civil Liberties Union, said in a statement to NBC News. "CBP should instead address its troubling track record of abuse by adopting reforms, like body-worn cameras, to increase transparency and accountability." Genia Blaser, a staff attorney for the Immigrant Defense Project, said the new Department of Homeland Security statistics echo anti-immigrant rhetoric from the Trump administration. “Even the language of the report underscores the inhumanity of the Department of Homeland Security and the system that has never treated the immigrant community fairly" Blaser told NBC News, referring to the report addressing immigrants as "aliens." Blaser said the jump in ICE arrests has cast a chilling effect that impacts individuals on all sides of the criminal justice system, including immigrants attending court to seek justice, such as victims of domestic violence and human trafficking. The department’s report arrived days after a homeless Mexican immigrant who was ridiculed by then-candidate Trump was found not guilty of murder after he was accused of fatally shooting a woman on a San Francisco pier. Jose Ines Garcia Zarate, 45, was acquitted in the death of Kathryn Steinle, 32, who died in her father’s arms after being shot on July 1, 2015. The case roused anti-immigrant sentiment and forced San Francisco officials to defend their “sanctuary city” policy.